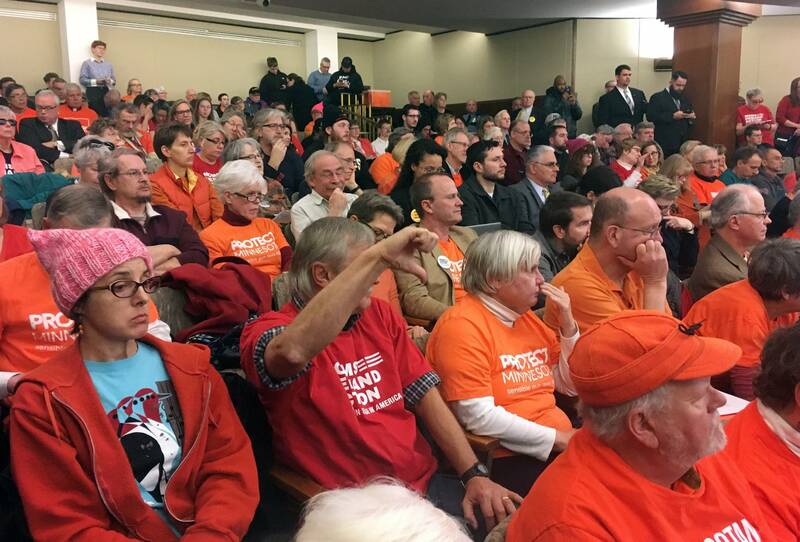 Gun rights supporters and gun control advocates debated two bills at the Capitol Wednesday. One would eliminate the state's permit-to-carry requirement and the other would expand a person's right to use deadly force in self-defense. Under current law, Minnesotans need to be trained by a certified instructor before they can get a permit to carry a handgun. Opponents of the proposal to eliminate that requirement said it makes no sense to allow people to carry guns in public without first undergoing training. Retired Air Force veteran and gun owner Tim Nelson told lawmakers he doesn't think it's a burden for responsible gun owners to get proper training. "In the military, I was required to qualify every year with my sidearm," said Nelson. "Every year. And I had to be proficient, competent with my weapon and know what the rules of engagement were." If passed, the law would still allow gun owners to voluntarily undergo training. The bill was also opposed by several law enforcement groups. Representatives from the Minnesota Chiefs of Police Association, the Minnesota Police and Peace Officers Association and the Minnesota County Attorney's Association all testified against the proposal. Dennis Flaherty, of the Minnesota police and peace officer's group said the bill poses a safety risk for law enforcement officers. People who favor the bill say the time and money required to undergo handgun training to obtain a permit can prevent some people from exercising their Second Amendment rights. Robb Doar is a permit to carry instructor and a member of the Gun Owners Caucus. He supports the proposal, even though, if passed, it would mean he'd lose a chunk of his permit class business. Doar said opponents of what he calls "constitutional carry" are voicing the same concerns as people who opposed the passage of the handgun carry law in 2003. "There was rhetoric that blood would be running this streets and there'd be shootout[s] over parking spaces," said Doar. He added that those scenarios never came to pass and that violent crime in Minnesota has been on the decline since the carry law passed. According to the BCA, a record number of permits to carry were granted last year. There are more than a quarter million people in Minnesota with valid permits to carry guns. The bill was introduced by Rep. Jim Nash, a Republican from Waconia. He said an increasing number of states are passing or considering similar laws, including neighboring states South Dakota and Wisconson. Scott Rausch, with the National Rifle Association says the organization supports the movement toward so-called "Constitutional carry" laws. "We as an organization, and our thousands and thousands of members across Minnesota believe that an individual should not be required to pay a fee or obtain a government-issued license or permit to exercise his or her Constitutional right to carry and possess a firearm," said Rausch. However, the jury is still out on whether the Second Amendment includes the right to bear arms in public. Recent federal court decisions have rejected attempts to overturn restrictive carry laws in other states. "Every one of the courts has upheld discretionary permitting for concealed carry," said Adam Winkler, a professor of constitutional law at the UCLA School of Law. "So, (they) upheld the very restrictive kinds of laws you have in places like New York, California, Washington DC." Winkler is also the author of "Gunfight: The Battle over the Right to Bear Arms in America." In the absence of a Supreme Court ruling on the constitutionality of public carry laws, Winkler said gun rights supporters are now pushing for a national reciprocity law. He said, if passed that could allow people to carry firearms in any state, regardless of that state's requirements. The House public safety committee also heard testimony on what's known as a 'stand your ground' bill. It would authorize a person to use deadly force to resist or prevent the commission of a felony in the person's home, resist or prevent an imminent deadly threat to himself or another person and resist or prevent the commission of a forcible felony. The bill also creates a presumption that a person entering or attempting to enter by force or stealth into a person's home or occupied vehicle is doing so with an intent to threaten someone's life. Supporters said the bill would clarify the use of deadly force and put Minnesota more in line with other states. Opponents said the bill goes to far. "This bill gives citizens more right to use deadly force than police officers have under current law," said Dakota County Attorney James Backstrom. The committee postponed votes on both proposals until a later date.